Sutter is trying to keep up with Lindsay Lohan with his shenanigans. After a lovely evening out with friends, Carl and I got into our car as his cell phone started buzzing. The first words Carl heard were, “This is the Sunnyvale Police.” Carl thought he was being pranked by some friends. Then he heard, “Do you have a dog named Sutter?” Gulp. Uh… ya. Apparently, Sutter busted out of our yard again and was patrolling the streets looking for chocolate when a neighbor spotted him. She put him in her car for safe-keeping and tried calling Carl for two hours. She finally gave up and called the police. Fortunately, the cop thought he’d try calling one more time before booking him and taking him to the pound! Carl told him we’d be home in 10 minutes. As we drove into our driveway, the cop car pulled up with a happy Sutter sitting in the back seat. 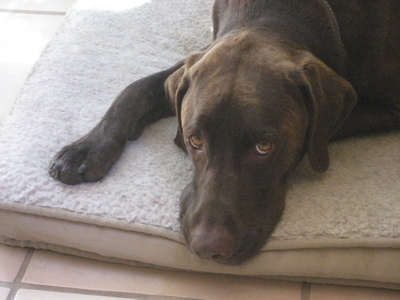 I hung my head in shame and hid in the house while Sutter bounded out, tail wagging, without a care in the world. For some reason I don’t think that experience taught Sutter anything… or at least taught him how to be a good doggie. 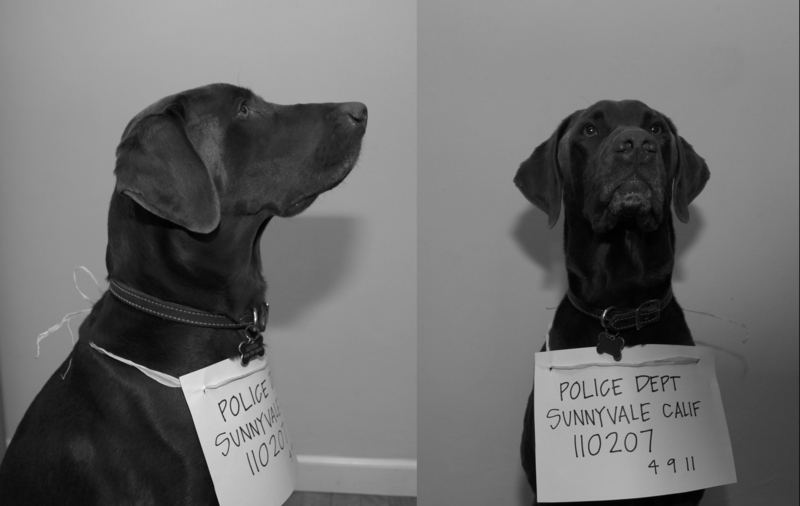 And now the Sunnyvale Police Department knows that our dog does not aspire to be a “canine on duty” but a rebel without a cause. We have not forgotten you. Yes, you now have competition for our attention, but how could we forget you? We thank you for being our silly doggie, but you don’t need to worry. We have not forgotten you. Sutter has officially made it onto Santa’s naughty list. Apparently we didn’t tell him that you can’t eat Santa. Here’s what happened. On Sunday before we headed to a party in the city, we put Sutter in his “secure” crate in the kitchen. It’s been raining a lot here, so we figured that’s the place he’d like to be. We were wrong to think he’d be calm and resting in the crate while we were away. Everyone knows that dogs can’t eat chocolate, right? All in all, we think he consumed more than 32 ounces . 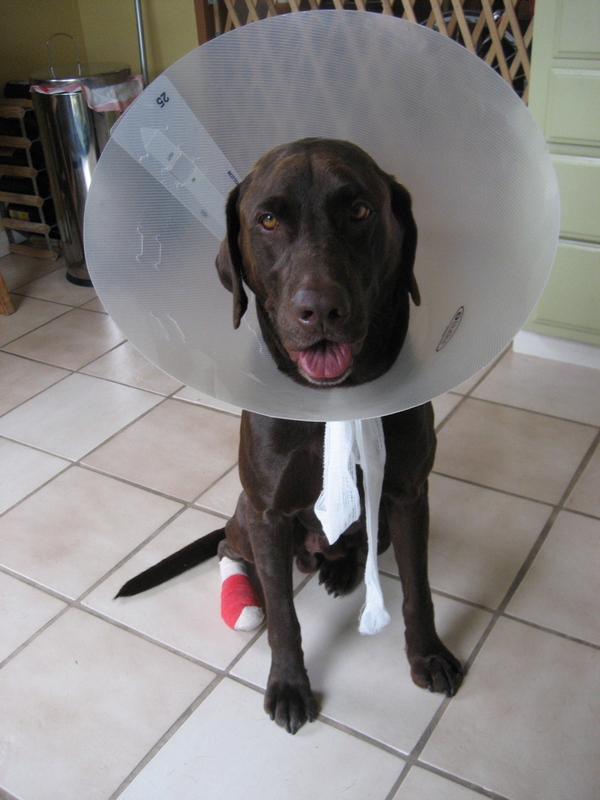 Umm… another vet bill? After our calculations, we called the emergency number and a tech gave us the detox solution. Hydrogen peroxide. So for the next two hours, we forced this down his throat to get him to throw it up. We’ll just call that time Sutter’s torture chamber. So far, he’s survived. 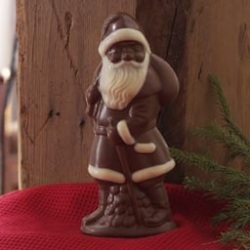 But now, he’s not only on Santa’s naughty list, but ours as well. Hope he likes coal in his stocking. Oh, he’ll probably just eat that too. As a side note, we’ve nicknamed our dog with the name “Sutter Butter.” A few weeks after we gave him this name, we discovered that he ate an entire stick of butter which he snagged off our counter. I guess he wanted to live up to his name? 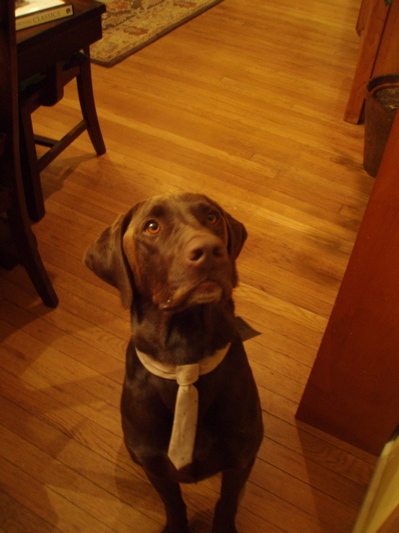 Now, being a chocolate lab, we see that he takes things quite literally. Dog Whisperer… please come down the chimney to help us! Yes, we did what “those” people do before they have kids. We celebrated Sutter’s birthday – complete with a chocolate cake and singing. 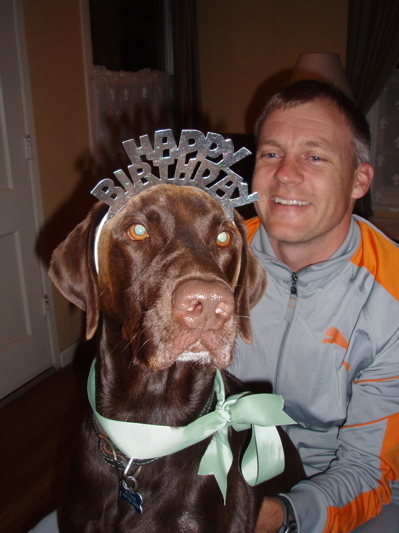 He even chimed in with some barks during the “Happy Birthday” song. We’re sure he appreciated it. He still acts like a teenager, even though he’s 28 (4 in adult years). Good thing he’s cute! 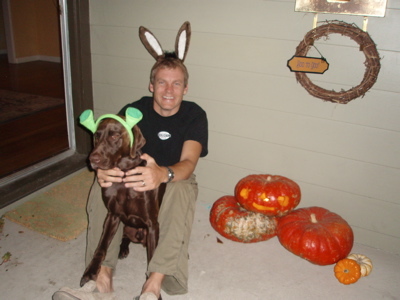 And, he couldn’t be a dog in my house unless we made sure he had his own set of costumes, right? You can tell by the look on his face, that he really appreciates this. Sorry buddy. Interviewing for his job as Chief Begging Administrator. You’d hire him, right? Here are step-by-step instructions on how to walk your dog. Notice the green Jetta in the background? Say “bye-bye.” Donating it to science this week! Yes, folks. We are now the proud owners of a dog named Sutter. I hesitated on posting this blog until I knew Sutter had passed the trial period. After our first week with him, I wasn’t sure if I should submit a script for a movie sequel to Marley and Me. Yes, it was that exciting. To copy the MasterCard commercials, here’s a nice recap of our first week and an alarming introduction to dog-ownership. Owning a dog and adding a new member to our family: priceless. He’s a sweet 3-year-old doggie, loves kids, and adores Carl…his pack leader for sure! (Yes, we are now faithful followers of The Dog Whisperer.) 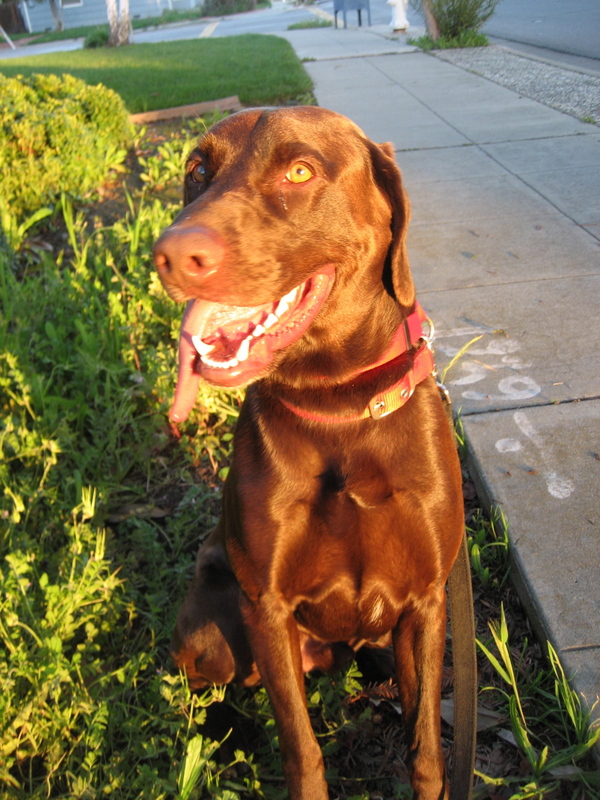 We adopted Sutter from Lab Rescue (we just wish they would have prepped us a bit more…phew!). We named him after Sutter Street (where I lived in San Francisco). The crazy thing is that his original name was Bear, but since that’s Carl’s nickname for me, we thought we’d avoid confusion and change his name. And frankly, I don’t want to have the same name as the doggie. Sit Boo-Boo. Sit. Good boy.